The Specter of Newby Church. Spooky apparitions, spectral children, and wraithlike women in white have long been the subjects of traditional ghost lore told around the hearth – but we all know those are just fables. Right? They say the truth is stranger than fiction, and these 10 creepy photos will have you second-guessing whether they’re real or not. Check them out below. 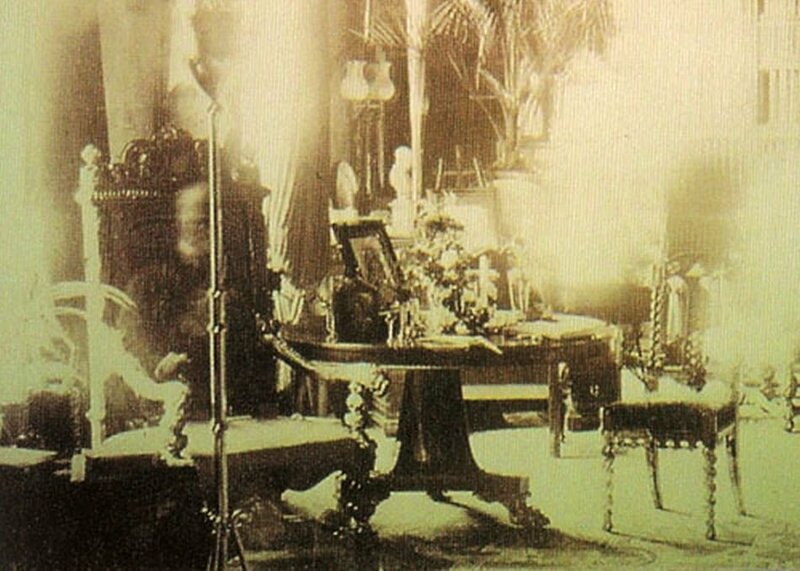 Sybell Corbet’s 1891 photo of the Combermere Abbey Library in Cheshire, England, seems to depict the ghost of the late Lord Combermere, sitting in his chair. The alleged ghost of Lord Combermere in 1891. Amateur photographer Corbet allegedly set up her camera and took this hour-long exposure while the funeral of her brother-in-law, Lord Combermere, was taking place four miles from the home. Interestingly, the apparition that appears to be sitting in the deceased Lord’s chair is suggested to be Lord Combermere himself. This group portrait, taken in 1919, is of Sir Victor Goddard’s Royal Air Force squadron, and seems to feature the face of a mechanic who died two days earlier. Sir Victor Goddard’s RAF squadron. This group portrait of Goddard’s squadron, which had served in World War I at the HMS Daedalus training facility, is said to feature the ghostly face of Freddy Jackson, a mechanic who had been accidentally killed by an airplane propeller two days earlier. His face is said to be visible behind the airman in the top row, fourth from the left. The photo was allegedly taken on the day of Jackson’s funeral. The photo on the right was said to show the spirit of a deceased terrier reuniting with his canine best friend. The spirit of the terrier can allegedly be seen in the photograph on the right. According to a 1939 print of LIFE Magazine, the terrier in the left photograph was the beloved playmate of the big dog, pictured right. After the terrier died, the dog on the right was heartbroken. The above right photo was snapped by a psychic photographer of the big dog with its owner, and allegedly shows the spirit of the small terrier hovering directly over the big dog’s backside. This picture of the supposed ghost of Abraham Lincoln with his widow, Mary Lincoln, was taken circa 1870. It is considered one of the first examples of spirit photography. The ghost of Abraham Lincoln with Mary Lincoln. William Mumler was originally an engraver in Boston who treated photography as a side-hobby. After developing a self-portrait and discovering a surprise “girl made of light” in the final print, he became one of the first spirit photographers – someone whose principal goal is to capture ghosts and spirits in photographs. The title earned him both acclaim and scorn from the spiritualist community. Though many accused him of fraud, no one was able to debunk his methods. The above photo purportedly depicts a shadowy late Abraham Lincoln hovering behind his mourning wife, Mary Lincoln. William Hope, a premiere pioneer of spirit photography, took this photo of a couple and an alleged female spirit around 1920. A couple with a young female spirit. Hope was hugely in demand as a medium: families wanting to get in touch with their deceased loved ones sat for his photographs. As a member of the “Crewe Circle” — a group of spiritualists from Crewe, England — Hope claimed to be able to photograph spirits. The alleged spirit of Major Leverson. Taken in 1931 by Hope, this picture purportedly depicts the spirit of Mrs. Hortense Leverson’s deceased husband hovering behind her head. Paranormal investigators sought to expose Hope as a fraud in 1922, but his believers never doubted him. The alleged spirit of William Barrett. In other words, Hope used multiple exposure techniques to add ghostly spirits to photos. Hope’s followers and fanbase remained loyal, and even claimed to spot the controversial photographer’s ghost in photos after his death. Originally taken in 1936 by Captain Hubert C. Provand, this photo allegedly shows a ghost that haunts Raynham Hall in Norfolk, England. The Brown Lady of Raynham Hall. According to legend, the identity of the ghost in the photograph – the “Brown Lady of Raynham Hall” – is none other than Lady Dorothy Walpole, the sister of the first Prime Minister of Great Britain, Robert Walpole. According to lore, Walpole – the second wife of Charles Townshend – had an affair with Lord Wharton. When Townshend found out he locked her up in Raynham Hall, where she stayed until her death in 1726. London-based photographer Captain Hubert C. Provand snapped the photo in 1936, where it ran in Country Life magazine later the same year. When Reverend K.F. Lord took this photo in 1963 inside the Newby Church in North Yorkshire, England, it was met with skepticism: many believed the apparition was merely the result of a well-done double exposure. Lord maintained that the spectre in the photo wasn’t doctored. Richard Boursnell, a spirit medium and photographer, captured this photo of spiritualist William Thomas Stead and a purported phantom who was identified as Piet Botha, a Boer commandant killed in the South African War. A man named F. C. Barnes visited Boursnell in 1908 and attempted to expose the photographer as a fraud, claiming that he recognized the “phantom” in the photo as an image Boursnell had taken from a book of the late-Empress Elisabeth of Austria.